Professional webmasters and system administrators have to make sure that their web servers, websites and services are monitored constantly to be able to react immediately if one of the systems or services fails. But it is not always the professional users who needs those tools. Basically any user who runs a website or server should check those regularly to ensure they are working properly. Check Host is a free application for Windows that can be used for this monitoring purpose. The software program offers two methods of checking servers and services: Ping and Socket Connection. Ping will perform a simple ping to the selected hostname or IP address while a socket connection needs to be configured with a protocol (TCP or UDP) and a port. It is furthermore possible to define the interval in which the checks are performed and the timeout which will trigger notifications if those have been configured. Speaking of which; The program supports desktop and email notifications and starting a program or batch file whenever a server check produces a timeout. The same options are also available when the service or server are available again. All services and servers that are monitored are displayed in the main interface of the software along with their description, hostname or IP address, method and time the last check was performed. Some or all of the checks can be paused at anytime and a double-click on a row will open the configuration for that specific service or server again. The options contain the interesting feature to write a protocol to a file which can be a great way of analysing server availability over time. 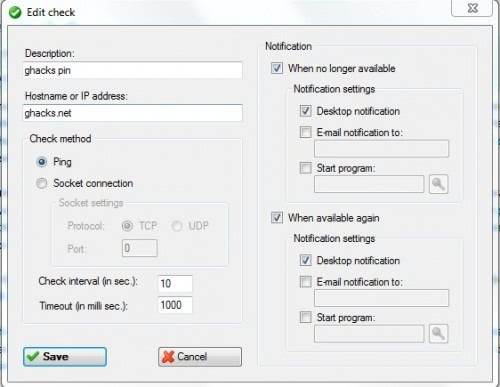 It is here that the user needs to configure the SMTP server if emails are selected as part of the notification setup. Check Host is a basic service and server monitoring software for the Windows operating system. It requires the Microsoft .net Framework 2.0 and can be downloaded directly from the developer's website. It is compatible with most editions and versions of Microsoft Windows including Windows 7.